Ladies cotton handkerchief with pretty thistle embroidery and initials or short name of your choice personalised. Soft cotton handkerchief featuring a beautiful thistle flower motif to one corner. Personalised with embroidered initials or a name in the thread colour of your choice. 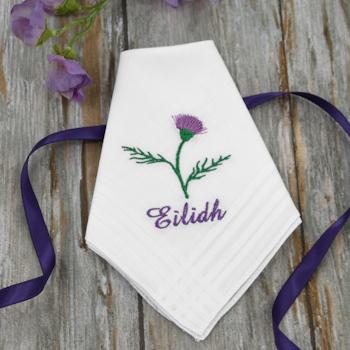 If you loved the embroidered hanky featured in the film Braveheart now you can have your very own personalised thistle handkerchief.